La Belle Aube, our modern luxury gite, 5 minutes from the village of Aubeterre sur Dronne, has been designed to provide a safe and secure environment for families, both young and old, while providing the best views of the valley, which our gite overlooks. Our property with its private heated pool, children's play area and 1 1/2 acres of fenced in gardens, provides your family with the opportunity to have either as relaxing or active holiday as you wish. There is lots to do in the area, with several river/lake beaches, golf, tennis, horse riding, kayaking, painting courses, etc all within 10 minutes drive. Dawn and I have 4 children - 10-19 years old, and fell in love with La Belle Aube when it was just a plot of land (and a family of 4), for its peaceful setting and fantastic views. At La Belle Aube we love that moment after arriving when we first sit on the terrace, open a bottle of wine and just soak up the view. Our boys on the other hand make straight for the pool and jump in, laughing and shouting. When they were younger it was roaming about the gardens, playing games without us worrying about where they were. On an evening we love to sit on one of the terraces or just wander about the garden, glass of wine in hand, just enjoying the views and peace and quiet. We know how difficult it can be for a family with young children to go on holiday so we try to provide everything a family would need for a great holiday! As soon as we saw the stunning views across the valley, the peace and quiet of Les Palennes, the rolling hills of the South Charente, we knew this was where we would build La Belle Aube. Since building La Belle Aube we have found great restaurants in every direction. Lots of interesting places to visit and lots for families, both young and old, to do. Aubeterre Sur Dronne is our favourite place with Sel Et Sucre for pankcakes and an ice cream parlour for our children and a great bar for us! Great views, peaceful environment and safe and secure gardens for young children to enjoy. La Belle Aube is all on one level with large doors and easily accessible living areas, bathroom and outside areas. Our master bedroom has an en-suite with w/c and level access shower, etc. Our disabled friendly main bathroom (3.5m x 3.5m) has a roll top bath and easy access shower area. In each bedroom with controls provided. Our open plan living area has seating for 6 providing a comfortable lounge area. For relaxation we have a 42" plasma TV with DVD player (a large selection of DVDs provided for all ages), UK satellite TV, books and and a hifi / ipod sound system. Our fully fitted kitchen/diner has everything you would expect from a modern kitchen, including oven and 5 ring hob, full sized fridge/freezer, dishwasher, washing machine, microwave etc. The dining area has a full sized table with plenty of seating. Fully fenced in with lockable gates. Kayaking / canoeing is available on the local river for distances of 3km - 30km. Good family fun! We provide a range of adults and children's bikes to suit various ages. Fully shaded and fenced in. There is a nine hole golf course approximately 15 minutes away. Further afield you can find a hillside 18 hole course at Angouleme, approximately 30 minutes. Around Bordeaux there are also several municipal 18 hole golf courses to take advantage of, should you wish to do so. Our property is very disabled friendly with level access from the parking area to our extra wide front door (140cm opening) including a very low threshold. There are no steps or ramps within the house and all internal doors are 93cm wide. There is also a very low threshold providing easy access to the covered terrace. Our main bathroom is fully accessible with grab rails, level access shower, shower chair, etc. The toilet has a left to right transfer, with a drop down bar to aid support. Private heated pool for the sole use of our guests. Fully fenced in with child prrof access gate. New in 2015, fully roofed shaded area. Fully heated using air to water heating system. Notes on accommodation: Our gite is very family friendly with open plan living and gated access from the house to the garden. We provide plenty of baby equipment, including bath, bouncy chair, monitor, travel cot, appropriate toys, etc. We also have plenty of toys and a play area for children, from the age of 1 up to about 7. Over this age we have bikes, football, swingball, badminton, boules and of course, our pool. There is also the local water park providing a large slide, pedaloes and kayaks as well as a large swimming lake. Air conditioning is provided in the bedrooms to provide you with a comfortable sleeping environment, even after the hottest day. We also provide a telephone for free local calls along with free Wifi access. La Belle Aube also has a reversible air con heating system, together with a wood burning stove for out of season bookings. Our gite is strictly no-smoking. Outside: We provide all the equipment which you would expect from a luxury gite, from sun loungers and table and chairs around our 10m x 5m private pool, children's playground within easy view of our terrace, to our large BBQ and children's outdoor games. As we have an acre of land around our gite there is plenty of room for outside games, as well as football. There are plenty of rural paths/ tracks about to provide a safe environment for both walking and riding. Within our pamphlets there are two maps providing details of lots of local walks. If you are at our house at the right times of year you will be able to pick cherries or walnuts from our own trees. Cleaning / Towels / Linen / Maid service: All towels, bed linen and tea towels are provided, including pool towels. Should you wish to have a mid-stay or final clean please let us know and we can provide further details. Other: Our open plan living area leads on to our large covered terrace with excellent views across the valley. On the terrace are table and chairs for either an alfresco meal or just to enjoy the evening breeze with a glass of the local Pineau. A lovely property with great facilities and a lovely pool. Plenty of space for the kids! This was our 4th visit to La Belle Aube and once again it did not disappoint, the weather was fantastic, the pool was great to relax and cool down and the facilities in the house were good too, especially with the disabled access which is important to us. Plenty to do around and about with the beach at Aubeterre and the tree climbing at Poltrot. Also, plenty of nice restaurants in Chalais and Aubeterre. All in all another great visit. This was our third visit to La Belle Aube and we are able to relax as soon as we arrive. We have 12 year old daughter and 6 year old autistic twin boys so having a safe and secure environment is vital to us to ensure we enjoy our holiday and La Belle Aube offers that in abundance. The children spent each day in the swimming pool and the boys enjoyed playing with the toys available at the property. Would highly recommend for all ages. We have already booked our holiday at La Belle Aube for next year. 4th time we have stayed here can't recommend it enough. Beautiful and so relaxing. Everything you need is provided the welcome food and drink especially as we weren't able to get to the supermarket at the time we arrived .can't fault anything. The bungalow is well set out and very nicely appointed. Everything you could need is provided. Unfortunately the weather for our 2 weeks was awful so little use could be made of the pool but when at "home" it was a very pleasant environment to be in. The walk recommended is very good, long enough to stretch your legs and burn off a bit of lunch, but not so long to as to become a route march and countryside all around is beautiful. Although only my wife and I were there, so many toys games and activities are provided that children would be easily kept entertained either inside or out. My brother-in-law is a wheelchair user and would have no problem at all in the bungalow especially with the large walk or roll in shower in the family bathroom which is huge. In all this was a lovely setting for a holiday in France with easy access to the Charente and the Dordogne albeit some summer weather would have added to our own enjoyment, La Bell Aube cannot be blamed for that! Lovely gite in a beautiful area, very peaceful. We visited with our daughter ,son-in-law and 7 year old twin boys and there was something for us all. Loads of space for the boys to run, play games and they even went swimming in the pool in April as the weather was so good. 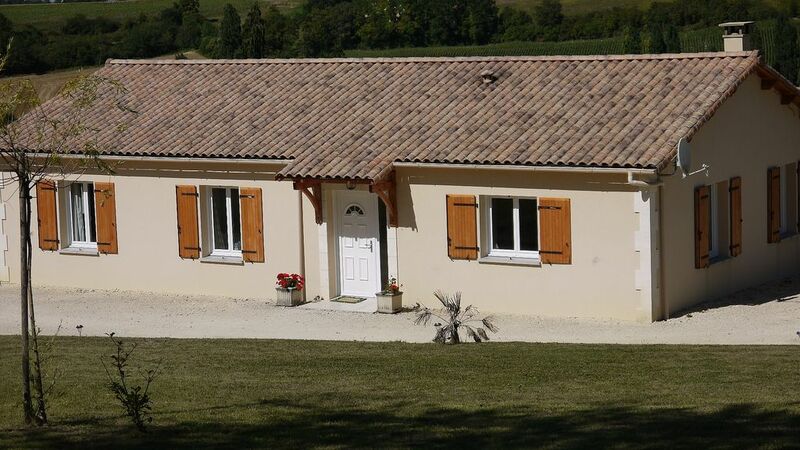 The gite is well equipped with everything you need and is very comfortable. The are so many beautiful places to visit and pretty villages to explore. We would like to visit again before to long. There are several lakeside beaches within 5 -15 minutes drive of our gite, providing several activities such as canoeing, pedalos, etc. There is also the river Dronne for kayaking and there are also several water parks within the area providing further facilities such as slides, etc. Return flights are available from Stanstead Airport, via Ryanair. Bordeaux and Bergerac airports are approx 1.25 hours away and are serviced by Ryanair, Bmibaby and FlyBE from many UK airports. Limoges and Poitiers airports are approx 2.25 hours away. The French TGV passes through Chalais, which is approx 5 minutes away. We are 6-8 hours away from the Channel ports depending on which one used. A car is essential for the area. The local market town of Chalais is only 4km away, providing for all your shopping needs, along with a good selection of bakers and butchers to choose from. Aubeterre sur Dronne, a "plus beaux village" is 9 km, and has a nice peaceful square to while away and afternoon. Here you will also find access to the river Dronne and a lakeside beach, tennis etc. Angouleme, with its fortified medieval centre is 40 mins away. Bordeaux is about an hour. On arrival we provide a welcome pack including bread, ham cheese, coffee, tea, etc. There are many good restaurants within the area, many of which are very family friendly. The Chateau in Chalais has a very good reputation and is also happy to have children. Aubeterre sur Dronne is a lovely little hillside village with a small central square with 4-5 restaurants. Here you can have a meal, crepes, coffee or maybe something a little stronger. The market town of Riberac, once the capital of the Dordogne, is approx 25 minutes away and has a bustling high street with lots of shops and restaurants. You can also visit St Emilion for a wine tasting session, which is approximately an hour away. Bordeaux with its shops, restaurants and bars is an hour away or for something a little different you could take the TGV from Chalais into Bordeaux. Booking Notes: Changeover Day: Changeover day during high season is Saturday, out of high season we are happy to discuss this at time of enquiry. Notes on prices: Prices are for the property per week in UK Pounds. Out of high season prices include heating and electric. Discounts outside of peak season are available for returning guests.